By this age, most children are toilet trained, have developed verbal skills, are continuing to be more independent, and are taking an active interest in the world around them. They are interested in cooperating and accepting adult’s direction and enjoy playing near or with other children. They are attentive listeners to age-appropriate stories and have acquired a vocabulary of several hundred words which are intelligible most of the time. Three’s are in constant motion with endless curiosity and an irrepressible zest for life. 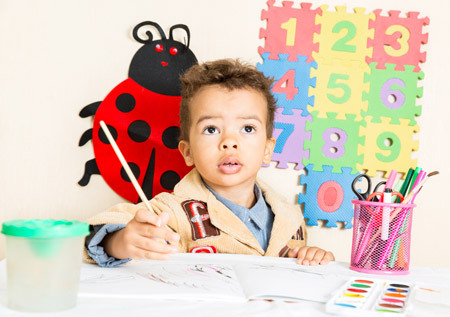 Our three year old room is a cheerful, inviting space for the active and curious preschooler. Children are drawn to a variety of interest centres where they can investigate items in the Science Centre, join with friends in the Dress Up Corner or sit on the child size sofa and enjoy one of the many interesting books in Story Corner. There is an easel to challenge future artists and sand and water tables to explore. Our playground is a safe outdoor area with a large playhouse climber and slide. A fort houses a large covered sandbox with lots of toys and a special area of the playground is set aside for gardening. On Just Kids Boulevard you will meet children navigating ride on toys down a cement walk. Caregivers are always close by to offer help and encourage children to test new skills and challenge their abilities. A child feel most comfortable when he/she knows in advance what is happening and when. Established routines provide consistency and allow a smooth flow of daily activities. Following morning activities, children sit together as a group for lunch, say grace and enjoy a relaxing meal with their friends and caregiver. Caregivers supervise and assist your child with brushing his/her teeth, toileting and washing up. Curriculum activities continue on into the afternoon and are extended to outdoor play when weather permits. Provisions are available for those threes who require an afternoon nap. Staff are happy to tell you about your child’s day and details of class activities are posted daily on the white board inside the classroom. Photos and stories, which document learning are stored in your child’s portfolio and are easily accessible to both you and your child. We encourage parents to share any information about their child that might be helpful.